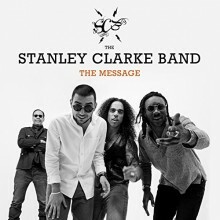 The release of Stanley Clarke’s latest album, The Message, comprises magnetic compositions that incorporate various elements of funk, jazz-fusion, and breakbeats. The band’s members—Beka Gochiashvili (pianist), Cameron Graves (keyboardist), and Mike Mitchell (drummer)—come together with featured artists such as Doug E. Fresh, Salar Nadar, Skyeler Kole, Trevor Wesley, and voice actor Steve Blum to cut this eclectic offering of hope, love and compassion. Group frontman Stanley Clarke has always been a prominent artist in the music industry with his funky bass lines, virtuoso technique, and versatility as a musician. He has maintained a successful career spanning over five decades, and in the past has collaborated with artists such as Chick Corea, Lenny White, Herbie Hancock, Béla Fleck, Jean-Luc Ponty, Marcus Miller, Victor Wooten, and Dee Dee Bridgewater, among others. Clarke also produced film scores for major movies such as Boyz n the Hood, Passenger 57, and What’s Love Got to Do with It. The inspiration of The Message stems from the band’s experience during a 2015 terrorist attack in Tunisia, which halted their tour in that country. During that time, the members of Clarke’s band composed new material, which they later recorded at the ICP studios in Belgium, laying the foundation for this album. The Message opens with a dialogue between Clarke and Fresh, paying homage to music legends Al Jarreau, Leon “NDUGU” Chancler, George Duke, Tom Petty, Chuck Berry, Larry Coryell, and Darryl Brown as Clarke sings, “And Ya Know We Missing You” along with Fresh providing the underlying vocal percussion. The next track, a stirring rendition of “After the Cosmic Rain/Dance of the Planetary Prince,” is based on a composition written by Clarke in the 1970s, and features a melodious synthesizer solo by Graves. The title track, “The Message,” begins with celestial pads evoking a cosmic atmosphere, followed by an expressive electric bass solo that serves as a counterpart to Clarke’s profound solo performance of Bach’s “Cello Suite, No. 1” on acoustic bass. “Alternative Fact” switches gears to an up-tempo swing groove, displaying both Gochiashvili’s impeccable piano technique and Mitchell’s explosive light touch on the drums. Finally, Clarke takes us out with a funky groove on “To Be Alive,” a song filled with rich horn backgrounds, percussive breaks, and Fresh’s rhythmic flow and tight lyrics. The Message is certainly a testament to Clarke’s creativity and longevity as a music artist. From beginning to end, the listener is taken on journey filled with sonic qualities that excite the spirit, satisfy the ear, and calm the soul.